The UN General Assembly meets Monday (February 13) to consider a draft resolution circulated by Saudi Arabia backing the Arab League peace plan for Syria, where intense bombardment of Homs by security forces since last Saturday has left more than 400 people dead. The president of the UN General Assembly Nasser Abdulaziz Al-Nasser, told governments earlier this week he would convene the General Assembly session on Monday to review a report on Syrian rights abuses by the Geneva-based UN Human Rights Council. He also invited the UN High Commissioner for Human Rights, Navi Pillay, to brief the council on the matter. The Saudi-sponsored draft (see full text below) includes much of the same language in the UN Security Council resolution vetoed by Russia and China last week, chiefly because it called on President Bashar al-Assad to step aside. 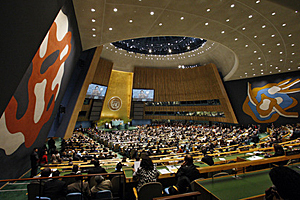 The Assembly draft also invites UN Secretary-General Ban Ki-moon to appoint a special envoy for Syria. There are no vetoes in the 193-nation General Assembly. And although Assembly resolutions are not binding on members, but were the Syria text to pass it would put added pressure on Assad’s regime.